Improving foot speed is one of the best things you can do to improve your times. Regardless of what race your are training for 5K or Marathon, faster foot speed, means faster pace. Sure, speedwork can seem like a scary beast you don't want to meet or know. But it doesn't have to be. 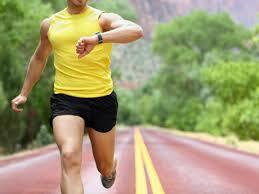 Runcoach's training system encourages at least 1 speed workout every two weeks. This setup can ease you into faster paces, and help your body adapt to a new stimulus. Speed training can spice up your training and lead to better fitness and performances. Have an open mind, and give it a shot! So you're g up for a big spring marathon and have been checking all the boxes. You are logging tons of miles, nailing all your workouts, and even have your race day kit and shoes picked out weeks in advance. But, have you considered your marathon fueling strategy yet? One of the most commonly overlooked aspects of marathon racing, is mid-race fueling. You body will endure a great deal of stress and will require carbohydrates and fluids to stay strong all the way to the finish line. The chances of hitting that "wall" are much less if you have been getting in a steady stream of calories and fluids throughout the race- But where should you begin? Research shows that the body is able to process 40-60 grams of carbohydrates per hour during exercise. While it would be fantastic for everyone to have their own personal bottles out on the course, just like the elites, this is not possible. So…what do instead? I recommend taking water every 5k, about 6-10 ounces, and a bit more if racing in hot conditions. A trick I learned is to squeeze the cups at the top to get the most out of each. In addition to water, I recommend taking a gel every 5k as well. Gels contain about 20 grams of carbohydrates and are easy to stash in shorts, sports bras, and pockets. Gels, combined with water, are a great option to help keep you hydrated and fueled all the way to the finish. If the idea of taking gels is not appealing to you, I recommend checking out the race website to see what sport drink will be offered out on the course. You can purchase this ahead of time and practice using it during your long runs to make sure everything sits right. Which brings me to the most important aspect of mid-race fueling, practicing your strategy ahead of time. It’s important to practice using gels and fluids during your long runs and workouts to make sure your stomach is able to tolerate the calories. Your body will get better and better at processing mid-run fuel so nailing down a strategy early on in your build up is key. Without practicing ahead of time, you run the risk of experiencing mid-race GI distress-something no runner wants to deal with! So hit your local running store and give a few different gel brands/flavors a try to see which one you’ll want on race day. You can also pick up many commonly used sport drinks at these stores as well. Practice your fueling strategy early on in your build up and often, then go check that final box! Happy Running! Stephanie took 32 minutes off her Marathon time in one year. She followed her Runcoach plan and paces religiously, stayed consistent and took it one step at a time to her Boston Qualifier for 2020! Taking 32 minutes off my marathon time in one year and Boston Qualifying for 2020! What is the secret to your success? Consistency. I hear people say that they aren't "athletic" enough to run long distances. And honestly, neither am I. But with consistency and regularly putting one foot in front of the other your small gains will grow to become huge achievements. Also, friends that share your same crazy passion. Without my local running club I'm not sure I would have achieved what I did. Company on long runs and people to keep you accountable is worth its weight in gold. What is the biggest obstacle to reaching your goals and how do you get over it? Summer in Texas. That's a joke . . . kind of. Summer in Texas is quite brutal, but it makes you strong. The true obstacle, for myself at least, was and has been feelings of doubt. Why aren't my long runs as easy as what I perceive other's to be? Why didn't I hit each one of my intervals at the pace prescribed? Why does everyone seem to run so effortlessly and my legs feel like lead? Then I remember, these are my PERCEPTIONS. My perceptions are not reality. Every run is not going to be perfect. This is the real world and there will be good days and bad days. And at the end of the day, as long as I gave it my best effort, I'm still making progress. So there is a lot of come to Jesus conversations with myself and being conscious of the times that I'm being too hard on myself. What is the most rewarding part of training? Looking back and seeing all of the progress that you've made. And realizing just how many people have supported you along the way and are happy for you. The running community is a phenomenal one, a place of camaraderie and where lifelong friendships are made and for ounce of energy I have given it, it has rewarded me 10 fold. What advice would you give to other members of the Runcoach community? Trust the plan. It works. And be consistent. Don't skip workouts and don't skip long runs. Adjust dates and times, but get out there and do the work. The progress may seem slow when you're in the thick of it, but it is happening and you will make huge strides when you compare the beginning and end! Running provides an individual goal. It is not dependent on coworkers, your boss, a team. It is all about what you put into it and what you want to get out of it. It's the most amazing sport with an amazing community. Take advantage of all it has to offer. I have made life long friends, run in foreign countries, and proven to myself there is nothing I can't accomplish when I put my mind to it and am consistent. Everyone has this same potential in running - to be a little better at something every day. And there just aren't that many things in life that provide you with that feeling. What feedback would you offer on the Runcoach experience? I ran two marathons years and years ago. With zero desire to run another. I was talked into running Marine Corps and through the marathon came upon Run Coach. Since that time I took my marathon from a 4:10:00 to a 3:38:00. In my running club many people use many plans, and most of them involve determining paces and running according to 5k, 10k, half marathon pace. It's all too much math and too much thinking for someone like me. Run Coach does it all for you and I cannot say enough times how perfectly it fits my schedule and personality. The progress is real and I'm so excited to see what new accomplishments await me in the future! Big breakthroughs don’t happen overnight. Steve shows us the importance of realistic goal setting, diligent training, and investment to physical and mental conditioning goes a long way. To qualify for the prestigious Boston Marathon is a goal for many. 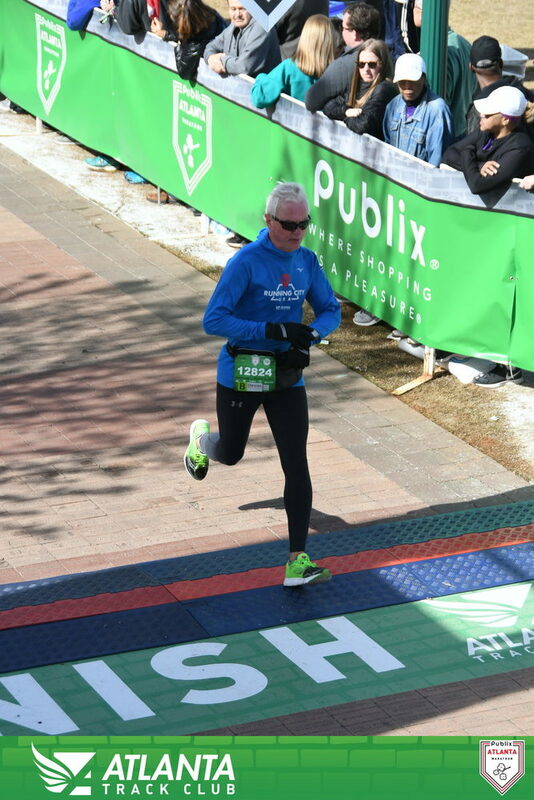 Read about how Steve grabbed his fifth BQ, on a hilly course in Atlanta, while finishing 1st in his Age Group! Qualifying for my 5th Boston Marathon and placing 1st in my age group at the marathon distance for the first time since I started running marathons 11 years ago. Staying true to the Runcoach training plan, support from my Runcoach coach, Hiruni, and terrific support from my wife who would drive a few miles to meet me midway through my long run and provide hydration, nourishment, and a word of encouragement. My biggest obstacle in reaching my goal was gaining enough confidence that I could once again run the distance at a speed sufficient to qualify for Boston. For the last few years, I’d been coaching myself and usually finished the marathon running on fumes and 5 to 10 minutes over the qualifying standard. Signing up with Runcoach gave me a more informed training plan which was challenging, but achievable. Having a highly trained and motivated coach to confer with really put me over the top. Week after week I could feel the difference in strength, speed, and endurance. As I worked through speed workouts, tempo/threshold runs, and long runs on Saturdays, my confidence that I would accomplish my goal grew dramatically. Daily training plans are focused on preparing ones body to reach new capabilities, but the sum total of weeks and weeks of training prepares one’s mind to support the body during the race. There will be times when you start to doubt the body can keep going and that’s when your mind speaks about your training and that you can do this. Unless you are sick or injured, push yourself out the door and get started. There may be days when your energy is low and you really don’t feel like working, but if you just get started, it’s amazing how quickly that changes. More than once, I was convinced I would not be able to complete the prescribed workout, but the outlook changed after getting that first couple of miles completed. Focus on the element of the workout you are performing and don’t think about the next element until it is time. Knowing my goal race was a bit hilly (Atlanta), I sought out some hills to incorporate into my training, but there was no linkage in the training plan to the elevation changes of my goal race, nor any specific hill workouts included in the training plan. Also, there is no option to edit a workout uploaded from Garmin to indicate the workout was actually a race and not just another run. In order to post my results for races, I’d have to manually load my finish time and then I’d have to delete the details of the run data that came over from Garmin or it would double up the mileage. 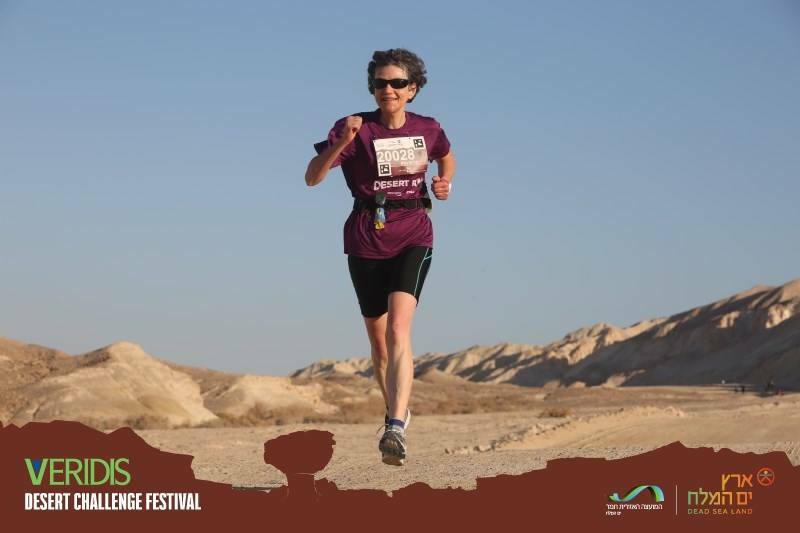 As a newcomer to the sport of running, Miriam finds an abundance of enjoyment on the trails and roads. She's 20 kg (44 lbs) lighter and minutes faster than when she started. Read about this University Mathematics Lecturer's "accidental" start and now long-term relationship with running! Though sometimes it is hard to get up and go out running, I know that it's worth making effort and start training. And indeed, after the first 10-20 minutes, it feels just great! Also, I try to follow the training schedule, and, in particular, to do workouts according to the schedule. In fact, till recently (i.e. till I joined Runcoach raining program) I just skipped workouts since they did not sound much fun to me. Now I have realized combining different kind of runs (easy, workouts, long urban runs and trails) is a right strategy and that it works for me. It is always hard to start doing workout, but I remind myself that it will help me to enjoy the types of runs which I really like, such as long urban and trail runs. After 15 minutes of training, it starts to feel good. I am lucky to live in Jerusalem, very close to good and beautiful trails, and also challenging urban routes. For me, the best treats are trail runs in the Jerusalem Mountains, with incredible flora and fauna. Also, running on Saturdays and holidays in Jerusalem, when it so quiet, peaceful and almost no traffic. This as close to paradise as I can imagine. Do not give up when it feels not fun. If you approach a difficult stage in your run, say "start a long uphill part, try to smile and think that the life is beautiful. Smiles really help in uphill runs" I have checked it experimentally. Having training program which is created by computer system is great, but all of us have our individual circumstances (say, stormy weather, illness or injury, other race events) and also our own tastes and preferences. So it is good to take a computer program as some general direction, and to adjust it to your exact needs. In this matter, communication with "real" coach has a great value, and personally I gained a lot from it! It definitely helps to feel that the Runcoach team values the achievements and encourages moving towards further goals (which includes a help finding proper future goals). I would suggest to increase flexibility in calendar. Ability for the runner to move future activities one-two days before or after the planned date. Also, it would be good to have a possibility to create a training program which includes trail runs, with respective assignments in terms of timing and running type in different stages of the trail. Though, creating such computer program is a very sophisticated task or just impossible, and perhaps one should just apply his/her own intuition and experience and, of course, consult "real" coaches. Ron is a former competitive Road Cyclist who set a goal to complete his first marathon in 2019. 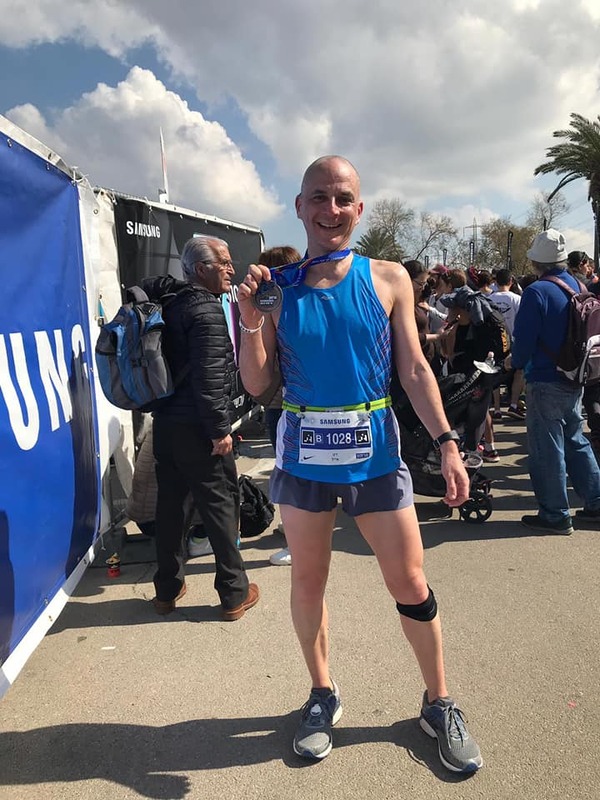 Read about Ron's training experience, and how his determination to succeed led to a stellar, well executed 3:33 marathon debut in Tel Aviv! A perfect training plan and amazingly accurate and personal support by Runcoach's team ( in my case - wonderful coach Hiruni Wijayaratne) that I followed with determination, dedication and faith in myself, in the coaching team and the application that proved over and over to be right to the point. I was amazed by the accuracy and the effectiveness of the application in terms of improvement and projection. It prescribes precisely what you should do - not too easy and not too hard with proven outcomes. But what really impressed, and later also motivated me was the personal attitude in the email support - I hadn't expect it to be so personal, dedicated and caring. I discovered not only professionals but also great people who really cares about you. Joe is a former linebacker and lineman, who found his running legs in the past year. 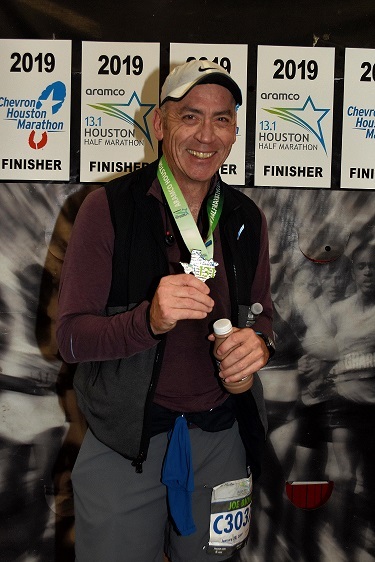 Through personal and family motivation, he lost 30 pounds, and recenly completed an incredible half marathon at the 2019 Houston Aramco Half Marathon. Read about Joe's journey to fitness, and how he found a way to quite the voice that wants to stay in the "comfort zone" below. After an 18 year fitness hiatus, my daughter asked if I could wear a 'skinny suit' at her wedding last year. Being far from 'skinny,' I began a fitness and diet regimen. I got to my goal by the wedding, then decided to keep going and run the Houston Half Marathon. I finished in 2:10, which was awesome for me. I signed up to use RunCoach since the last time I ran a half marathon, I trained for it by myself, and it was very tough. The guided workouts and increase in speed and tempo work, along with the rest and cross training days worked wonders! I felt so great running this half. Laziness, pure and simple. Finding the energy to start. My family and I had a crazy couple of years and I felt no desire to try and get fit. When my daughter handed me a goal, that's what got me moving. Just to be able to say at 57, I did it. And I was pretty proud of my time. I'm a former linebacker and lineman from high school football in Texas, I'm not the typical runner type. But, after losing some 30 pounds, it became much easier as the fitness returned. Watch the Little Voice in your head, that's very loud. It showed up a lot, especially towards the end. "Stay in bed. It's too cold." etc. I found 1,000 excuses to not get up and train, but no good reason, so begrudgingly, I moaned and pouted, and hit the road...grateful in the end that I did. The coaching response was awesome when I had a question. Thank you again. I truly think I would not have been able to do it without the help of RunCoach. I always found it amusing when the coach in the app, monitoring my pace, would say "that last mile was a little spicey..." I found myself pushing to get that response occasionally. Thanks again. 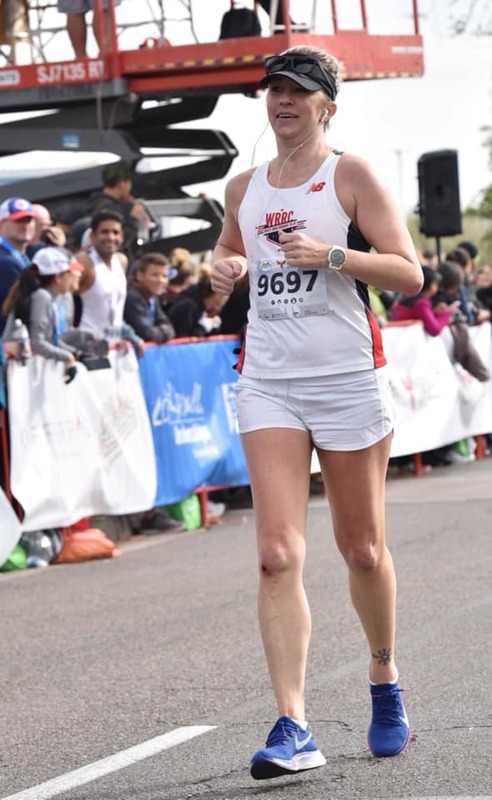 Jacquie recently ran an incredible sub 3 hour marathon at the 2018 California International Marathon . She accomplished this feat, while working a demanding full-time job, and fulfilling duties as a mom of three. This super woman shares tips to her success below. What is the secret to your success? Making the time to be consistent in training. And coffee. What is the biggest obstacle to reaching your goals and how do you get over it? 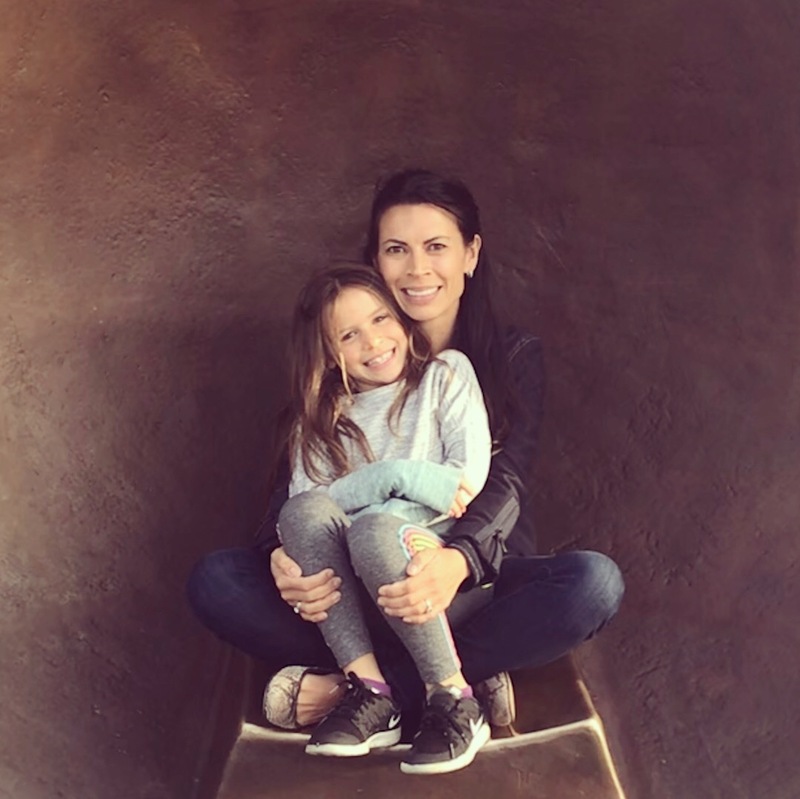 As a full-time working mom of three, finding time, consistently, to prioritize me and get my workouts done was, and is, a huge obstacle. In taking those 45, 90, or more, minutes, I initially felt some guilt over what I wasn't doing that was still on my day's list. But, after a few weeks I actually felt better every day having taken the time for myself to reach a goal allowed me to look forward to that "me" time. What is the most rewarding part of training? Other than that daily dose of endorphins, reaching new intermediate milestones week to week or month to month! What advice would you give to other members of the Runcoach community? Stick with it - getting started on any given workout is the hardest part, so just suit up, get out there and let yourself go. Anything else you would like to share? Alright, so I "found time" for myself to train, but what about all the other stuff in life that needed to get done? Let's be clear, some of the unimportant stuff just didn't, and additionally I had to get comfortable with the fact that it would get done later or in a different way (did the third grade class really need homemade cupcakes, or would those store-bought ones do just fine?). What feedback would you offer on the Runcoach experience? The Runcoach app made for my training and success. Having an overview of the week by email each week provides that look ahead to enable planning on when you'll squeeze your workout in. That alone would not be enough for me - having prompts through the app DURING each workout, especially speed and threshold workouts was critical and made tracking the workouts easy (albeit those speed workouts were hard!). 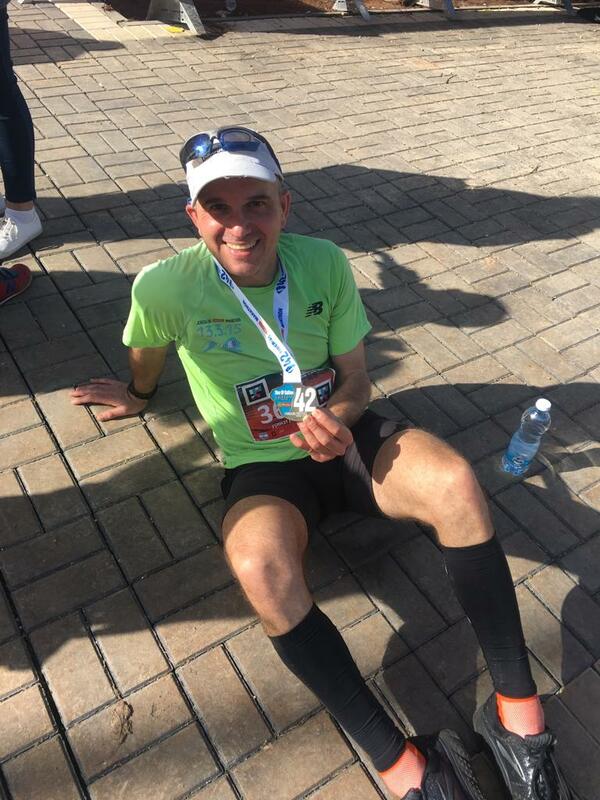 Oren ran his first marathon and felt supported throughout the training program. He discovered that he saw progress in fitness and mental approach too. He is an amazing example of how you can reach for your personal goals despite the work/life stresses surrounding you. Major milestone: Completed my first Marathon! What is the secret to your success? Great training plan and support by Runcoach and the entire team! Hiruni, Ashley, Tom and everyone else. We created a plan that worked and I stuck to it. Was prepared for the highs and also the lows of the race day. Hurray, I'm a Marathon runner! What is the biggest obstacle to reaching your goals and how do you get over it? There are always inner and outer obstacles. Inner is always the most challenging, with self motivation, self discipline and "coach-ability". Even on race day. The outer obstacles exist for everyone... Career, family life, physical health all require a great balancing act. Learning comes from persistence, miles and suffering it out (with a smile). I'd try not to look at a single training day or even a week, but always keep the long term goal ahead. For me, it's a process of moving forward, making the most out of the balance of internal and external forces. What is the most rewarding part of training? It's really great seeing how seemingly long distances have become easy. A half Marathon? No sweat! Let's blast it out! What advice would you give to other members of the Runcoach community? Training an executing a marathon is a completely different ballgame than shorter distances simply since there is much less tolerance for error on race day. I think my most valuable advice is to learn from the long training sessions (over 30km) during buildup and after every workout what needs to be adjusted and then apply it on the next. Trying a new strategy on race day is too late. Marathon is also very sensitive to execution: Nutrition, pace, and pace consistency. Bottom line, it's easier said than done to have everything under control especially for the first race. While avoiding a meltdown is best, I think it's best to prepare for it, at least mentally. It might and will happen, and you need to have faith to endure even if it lasts for a good part of the race. Anything else you would like to share? Training with Runcoach was a positive experience! I've trained with personal coaches for many years, and this was the first time going virtual. I found that the adaptive training plan together with personal email support (on my "entry plan") really works, and is definitely cost-effective. What feedback would you offer on the Runcoach experience? There are several rooms for improvement: - Adaptation of the training programs to the metric system. An example: a workout calling for for 3.2 kms (2 miles) sessions. - Adaption of the website and email literature to the metric system. For example: minutes per mile pace in various communications. What's so Special about the Long Run?